Examples show how task specific electrical stimulation can improve range of motion, (ROM), decrease spasticity (as resistance to passive stretch or motion) and improve trunk posture and function. NMES = neuromuscular electrical stimulation. TASES = task specific electrical stimulation. ES = electrical stimulation. TASES can improve the trunk, hip upper and lower extremities so that the posture and movement skills can be improved. Needed muscles are stimulated for a specific task or function no matter if the muscles are spastic or not. 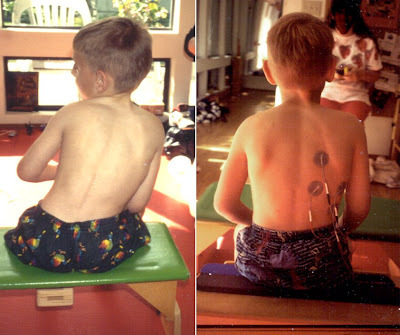 Below are four photographs of a child with spastic dipleiga who was beginning to develop a scoliosis. The first photo was taken before ES was used and shows that his back is curved. One set of two electrodes were used to the lateral trunk muscles show that his spine became straighter but the lower spine and the upper spine did not appear to meet. So a second set of electrodes were put on the erector spinae muscles. The back was straight with the spine appearing as one straight line. The last photo show how the child benefited from TASES as the back is straight without needed ES six months later. The next child (below) who is four years old, also benefited from ES to the trunk. The child had selective dorsal rhizotomy (SDR) and as often happens with this surgery, scoliosis developed. His back had deteriorated so much that he was scheduled for surgery to place metal rods in back bones in the next month. However, TASES was able to straighten the spine immediately when first used and the surgery was canceled. After four years the spine was still straight and he continued with his home ES program without surgery. Because the child is awake and aware of the stimulation, actively participating in a task and not asleep or lying down, carry over can and did occur. Movement science has shown that for there to be carryover from exercise or practice of an activity it needs to have be task-specific.